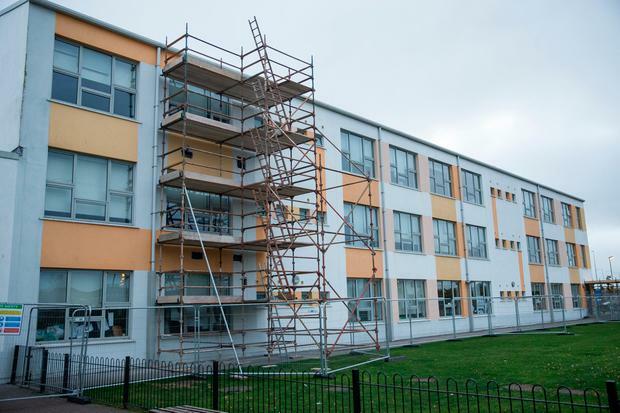 The Department of Education and Skills is suing a company over alleged defects in a €5m "rapid build" school which had to be closed for a part of a term last year to allow temporary remedial works costing €1m to be carried out. Last December, the Department brought proceedings in the Commercial Court over the alleged defects in Ardgillan against Western Building Systems (WBS) of Coalisland, Co Tyrone which designed and built it. On Monday, the department brought similar proceedings against WBS in relation to Tyrellstown which were also entered into the fast track commercial list by Mr Justice Robert Haughton. Eamonn Murtagh, principal officer in the department, says the building did not comply with fire certificate and/or building regulations and/or with the department's build requirements. He says a consulting engineers' report found issues with the strength and fixity of the walls panels in the building. This gave rise to a risk of a collapse/"fall out"of the outer masonry wall panel and the "fall in" of timber infill panels into the classrooms.